Here are the comments provided to us when Bruce spoke at the annual NSW SASS conference in May, 2010. Great day! Very informative! 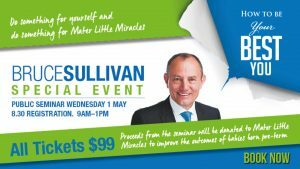 Fantastic guest speaker – Bruce. A great day! Bruce Sullivan a fantastic presenter!! An excellent and informative speaker. Bruce Sullivan – best sessions ever. Very stimulating and thorough presentation. Very informative conference. Fantastic thanks. Well run – great day. Good mix of themes and topics, very enjoyable. Bruce Sullivan fantastic. Great work once again – thank you! Bruce Sullivan amazing. Bruce Sullivan always good value. Wish I could take Bruce back to my school. Very well run. Thank you. Thoroughly enjoyed the day. I could sit and listen to Bruce regularly as great speaker. Best speaker I have heard plus entertaining. Rippa – loved Bruce – very inspirational. Bruce fantastic presenter and humorous!